Forsaking stable jobs in the big city, three university grads return to their hometown to make a quality rice-noodle product that benefits the village as well as consumers. Despite graduating from university and landing big-city jobs, three young men who had been lifelong friends wanted something more than just a big income, expensive clothes and other material signs of success. Their parents, however, had always wanted their sons to have high paying jobs so they could have a better life. But the three men were determined to follow their dream to start their own business and live independently. Much to the chagrin and shock of their families and neighbours, Nguyễn Đăng Tôn Cảnh, Nguyễn Phước Ánh and Nguyễn Hữu Vinh, all born in the 90s, decided to quit their jobs and return to their hometown in Triệu Phong District in the central province of Quảng Trị. Cảnh had studied economics at Huế University and Ánh the same subject at Đà Nẵng College, while Vinh had graduated from HCM City Transportation University. The knowledge they had obtained at school and in the workplace, however, would later serve them well. “We’ve been buddies since we were kids. Growing up, we all had the idea of returning to our village and starting a business, but we weren’t confident doing it apart,” Cảnh recalled recently. But, one day, during a meeting away from their jobs in big cities, they realised their dream was still very much alive. “Oh my god! We recognised that we were still dreaming of returning to the countryside to help it develop,” Cảnh said. But they weren’t sure about which career to pursue. Cảnh, however, was confident the three of them would find their way. “Every career has potential and if you care about it enough, it can develop in a stable way,” he said. So they returned to their hometown, Linh Chiểu Village, well-known for its tradition of making bún (rice vermicelli). Within a year of agreeing to pursue their goal, the trio produced their first batch of “clean” vermicelli. During that first year, they had faced many questions. How can we make our products different from the rest? What are our strengths and weaknesses? And, importantly, where are we going to get the money? They realised they had a competitive advantage over others: their grandparents, parents and relatives had a rich background in making traditional rice vermicelli. But, most of all, the three young men were full of energy. After saving a total of nearly VNĐ100 million (US$4,000) from their jobs, they decided to make preservative-free vermicelli which meets hygiene and food safety standards. Vinh said that many consumers had boycotted traditional vermicelli in the market because of low quality and a high level of preservatives. 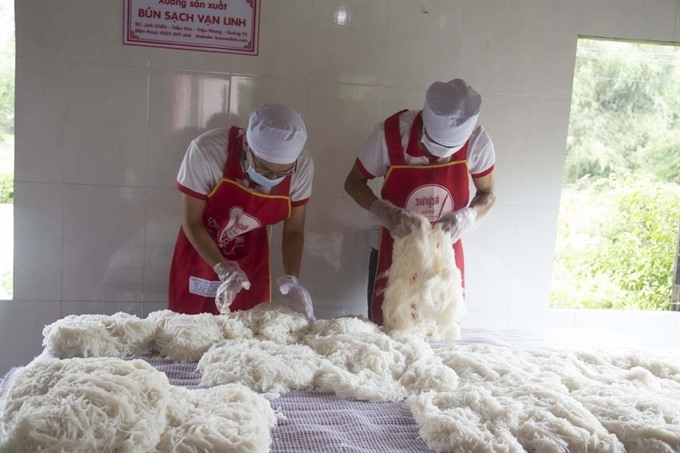 Even vermicelli made by Linh Chiểu Village had been affected by the trend, with villagers sometimes throwing away their product due to decreased demand. Their first branded products hit the market in May last year, packaged under the trademark Vạn Linh Vermicelli. “I still remember the first days after we launched ourproduct in the market,” Cảnh said. To increase sales, the three men advertised their new product in the region and continued to improve the quality with the aim of receiving certification from the local health authority. Their university studies came in handy on several occasions. With the IT skills they had learned at school, they set up a website to advertise their products. After that, sales of vermicelli increased day by day, including purchases by big restaurants in Đông Hà City and Lao Bảo Town. Although the price is higher than similar products, Vạn Linh Vermicelli is now the choice of many consumers. About 500 kilos of fresh rice vermicelli are sold each day in the province. The three men now want to expand production and sales to other cities and are trying out new products like dry vermicelli. Asked if they would like to receive money from investors, Cảnh said they wanted to first build a solid foundation since their business was still small-scale. For Vinh, quitting his job in big cities and returning to his hometown was a decision that he never doubted.